With my three month Brazilian visa coming to an end soon (and visa extensions not an easy matter for me), it was time to exit and there’s a grand exit to be had by seeing the impressive Iguazu Falls and Itaipu Dam at a point where Paraguay, Argentina and Brazil meet. 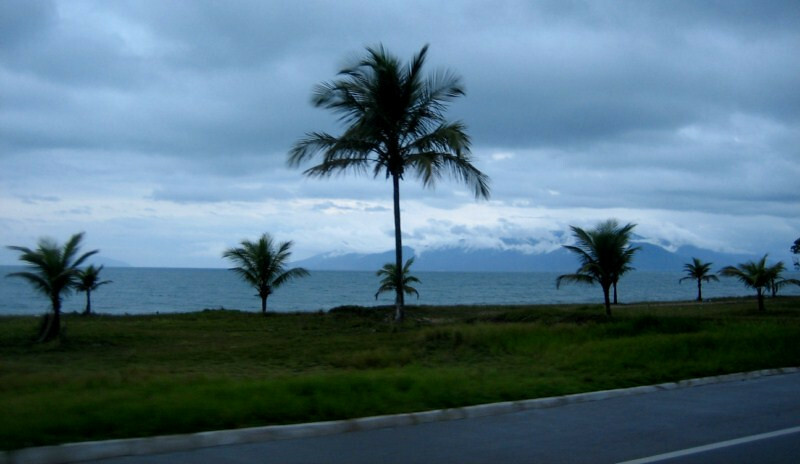 Saying goodbye to the beach life as I head south on BR-101 and climb up the Serra do Mar back to São Paulo. I passed through São Paulo on my way south and stayed with Fernando and Luciana again for a night. It was nice to see Buma. 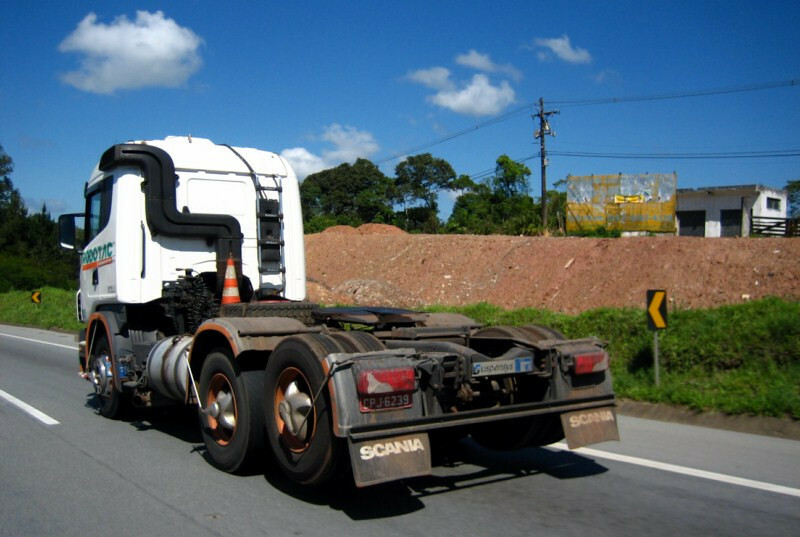 I’ve noticed trucks like these all over South America, which I haven’t seen further north. Where there are multiple axles, one of them can be lifted and disengaged from running on the road, increasing tire life and fuel mileage (as rolling resistance is reduced). I’ve seen them on trailers and the tractors. A good idea when running light. Also, almost all the trucks have the forced wheel speed limiters on them (the contraption on the wheel hub). Not sure how well it works, since most of the truckers drive quite fast, regardless. A typical meal at a roadside restaurant on the tolled highways. 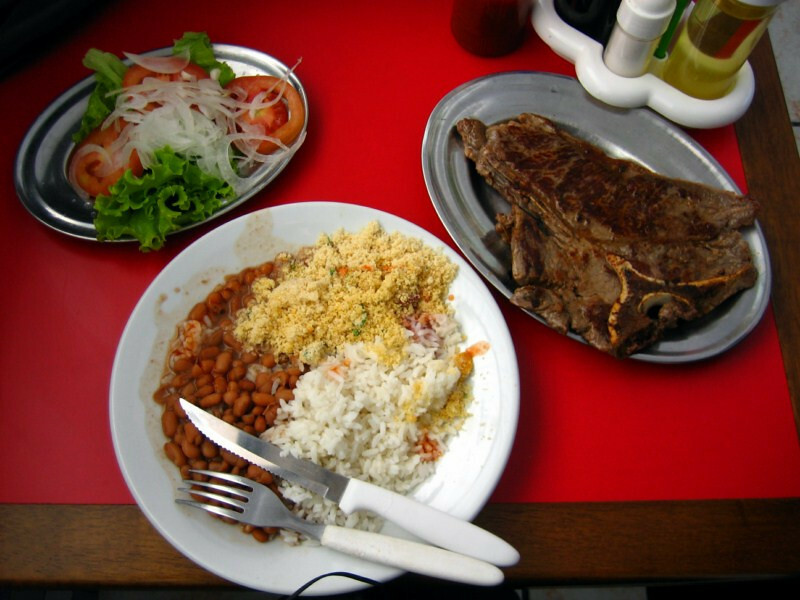 For R$13 (US$7.50) you get a piece of fried beef, rice, beans and a salad. The yellow powder is farina/farofa, powdered tapioca flour, which adds a crunch to the meal. 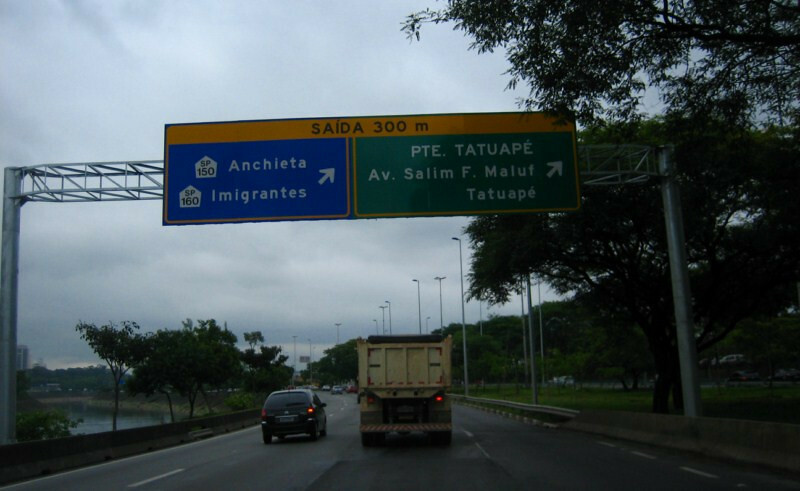 Heading south on the three-lane wide tollway of BR-116 from São Paulo to Curitiba. 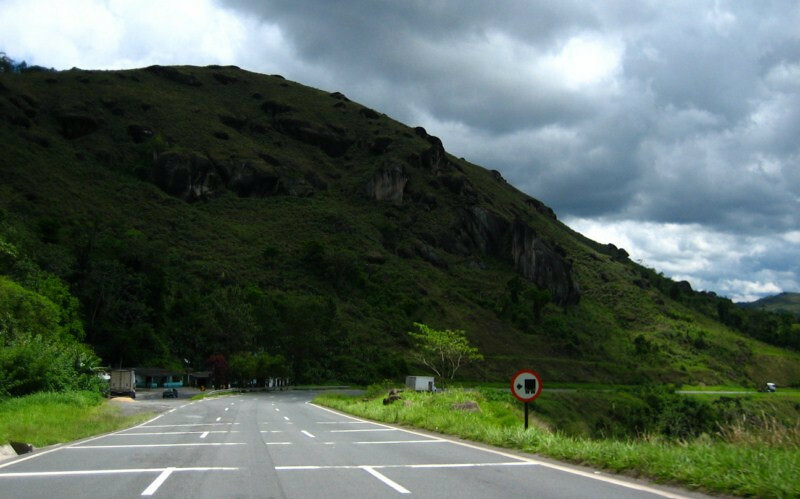 The curves and elevation made for a fun ride and the R$4.50 in tolls makes quick work of the 475 kms. 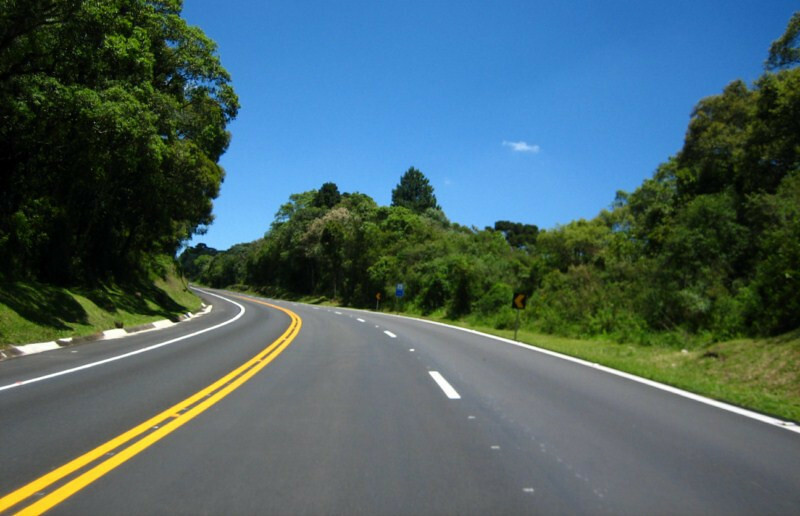 There are some sharp turns as the route winds along the hilly coast and there were numerous signs warning drivers not to apply the brakes when in a turn, leading to a tipover but to scrub off speed before a turn. Good driving skills to know. And to become a racer, the next logical lesson is to accelerate through the turn feeling the maximum g-forces. Meeting up with Reginaldo from Curitiba, outside the city at Portal da Graciosa. 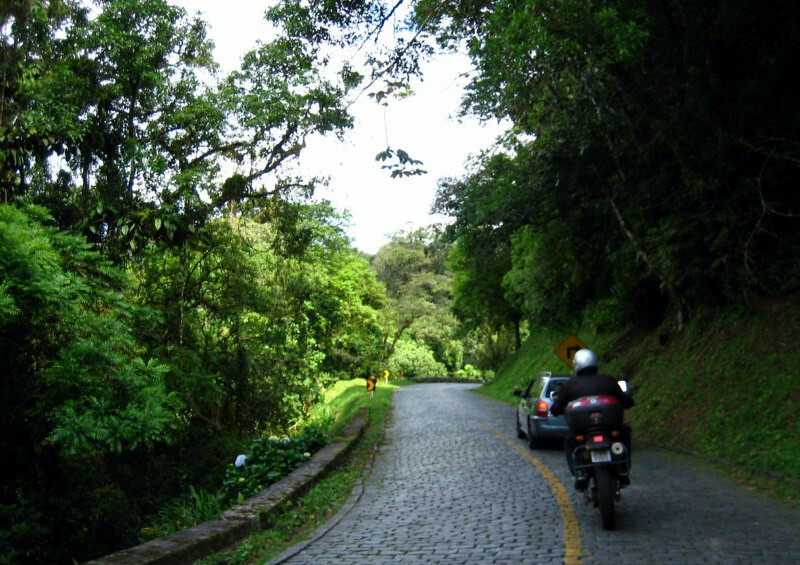 Reginaldo is part of the HorizonsUnlimited community of bike travelers and he’s been a helpful source to numerous travelers passing through Curitiba. He contacted me through facebook through mutual overland traveler friends. Riding the scenic route to Curitiba. Reginaldo’s traveled around South America a few times and on different vehicles, so his knowledge is invaluable. A fancy bus stop as we rode through the outskirts of the city heading to his house. 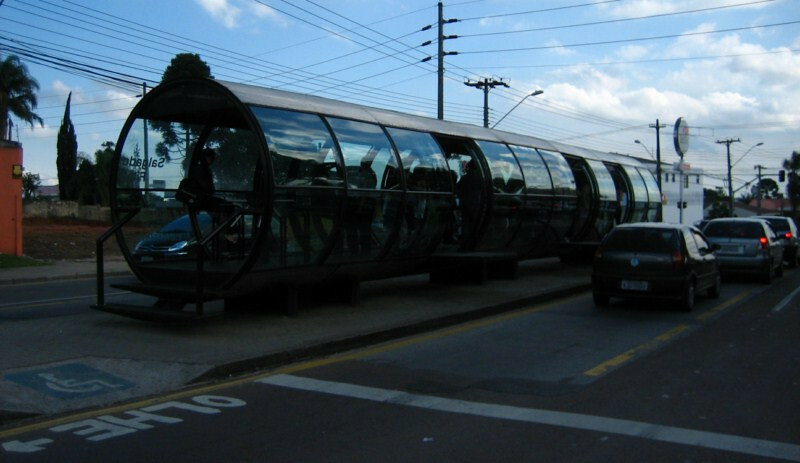 Curitiba is known as a well-planned city, that too for incorporating ecological principles into its design. I thought I would see more of the city when I came back later to apply for a Senegal visa before heading to Africa, but plans changed. 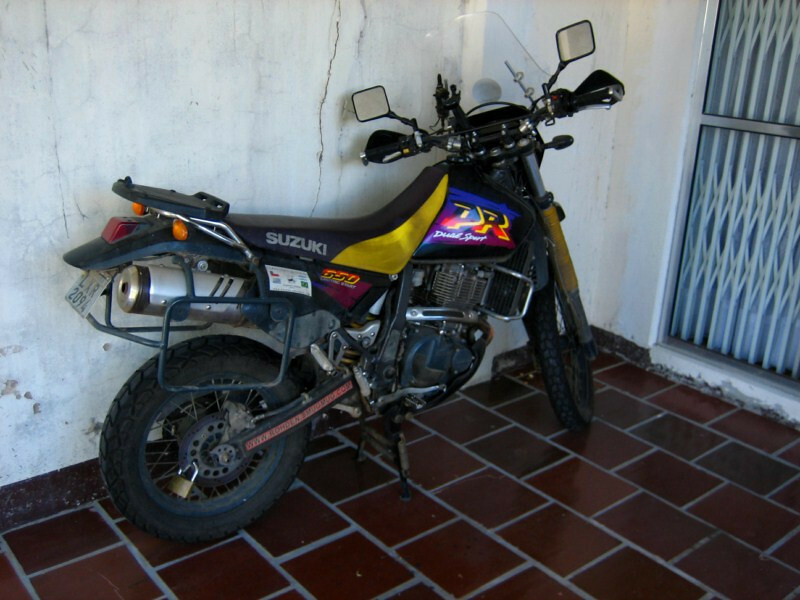 What was more special about the stay with Reginaldo was that he’s traveled all around South America on a 1996 DR650, 2 years older than mine, so sanDRina had some good company for the night. We poured over maps in the evening and he shared lots of good info on border crossings in Patagonia and where the sights were. He’s a true asset to the overland motorcycling community. Stop by and say hi if you’re passing through southern Brazil. 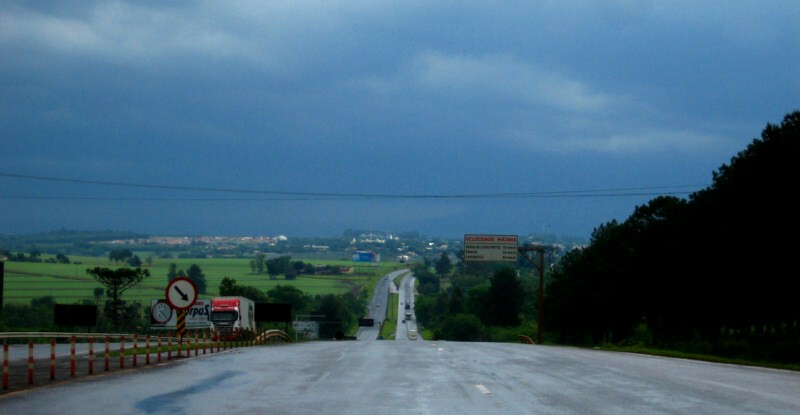 The next day, it was tollways again, cutting across the southern tip of Brail towards Iguazu. 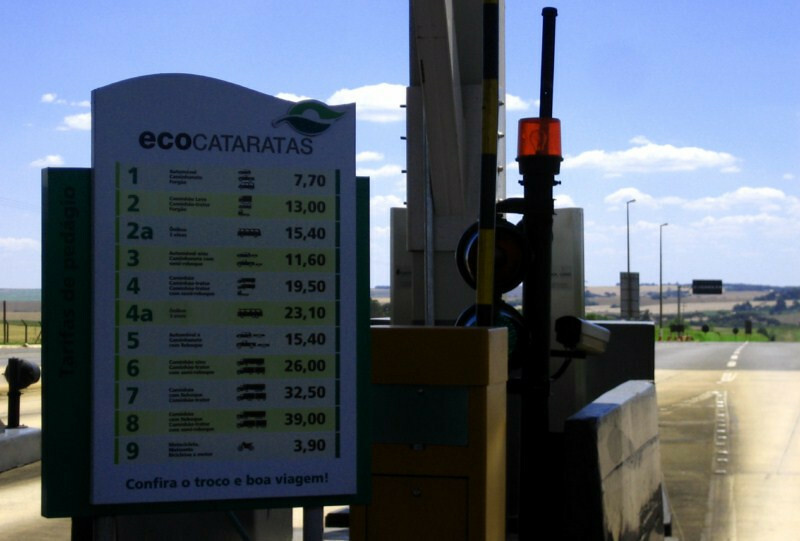 There weren’t any other good options besides the tollway, so you just have to fork over the US $15 in tolls for the 530 km stretch to Cascavel, near Iguazu. 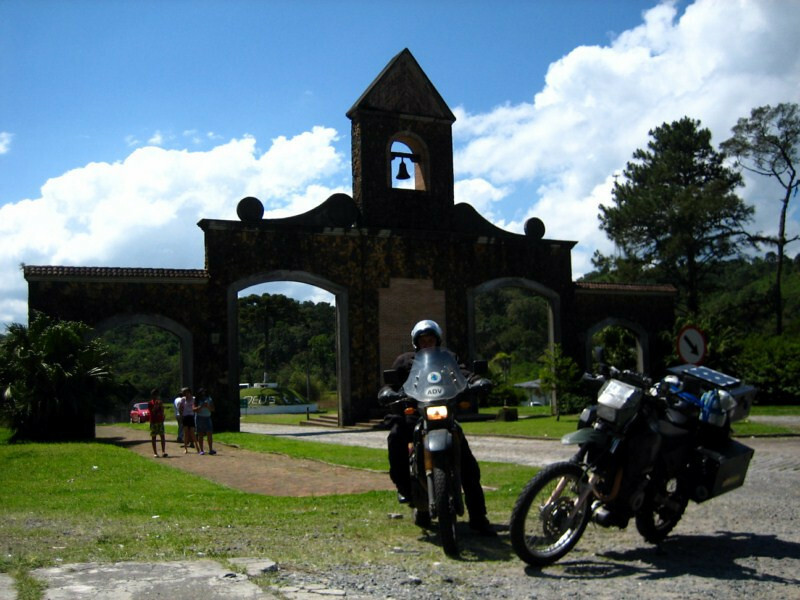 The most expensive day of riding in South America, not forgetting the expensive petrol in Brazil at US $5.30/gal (R$2.50/lt). Signboards on the freeway counting down the approach to a sharp curve, similar to brake boards on a race track. I guess there have been enough accidents of tipped over vehicles, probably truckers who didn’t slow down, that prompted these signs all over the highways. 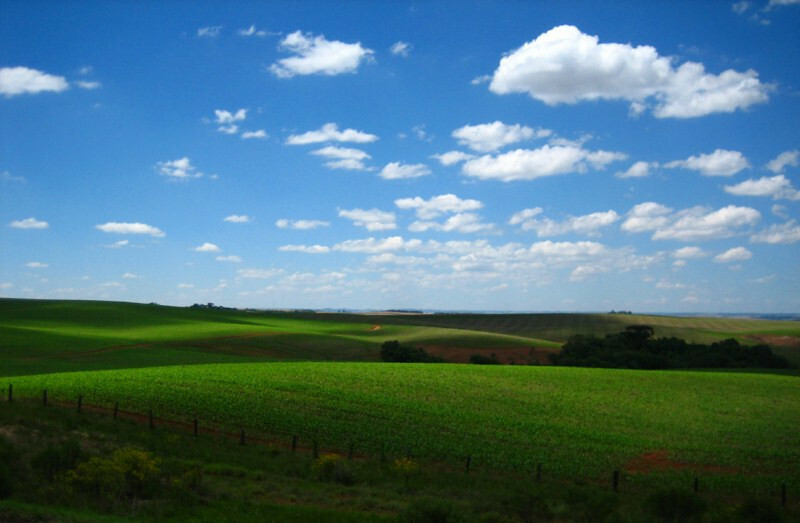 The great soybean fields of Brazil, feeding the animals of the world. A picture that could resemble Wisconsin or any other rolling farmland. At a toll booth. They think they can make you feel good for paying so much somehow by putting the word “eco” in their tollway name, but where’s the connection? And the crazy thing is that the price changed from one toll booth to the next. I met up with Tulio (yellow t-shirt) in Cascavel through CouchSurfing. He’s a lawyer with the government and we had a sushi dinner at a food court in a mall. 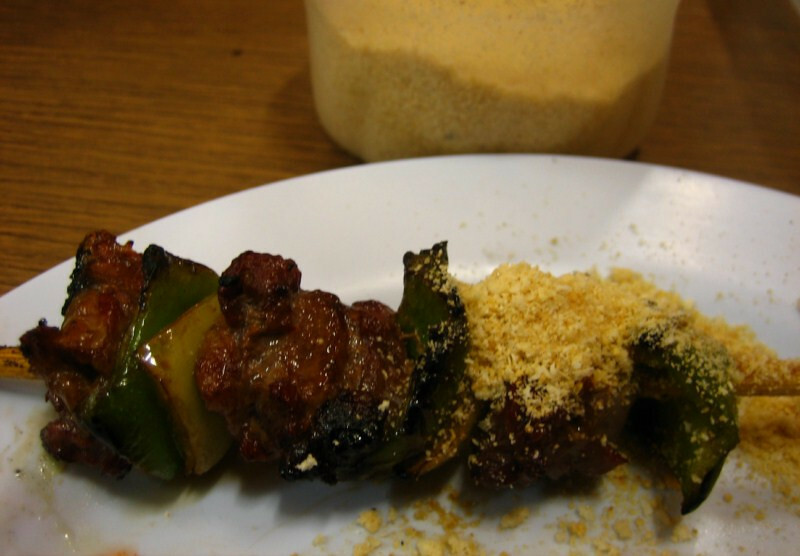 It felt so removed from my previous sushi dinner in Picinguaba. 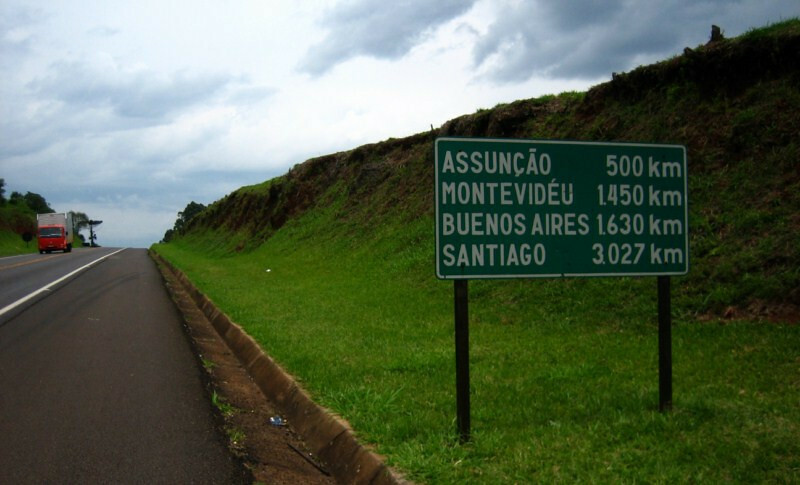 The next morning, as I neared Iguazu, I spotted this sign with distances to the capital cities of Paraguay, Uruguay, Argentina and Chile (in Spanish, the decimal and comma are switched around). As I neared the town of Foz do Iguacu, a thundering storm was brewing so I put off visiting the falls till tomorrow. 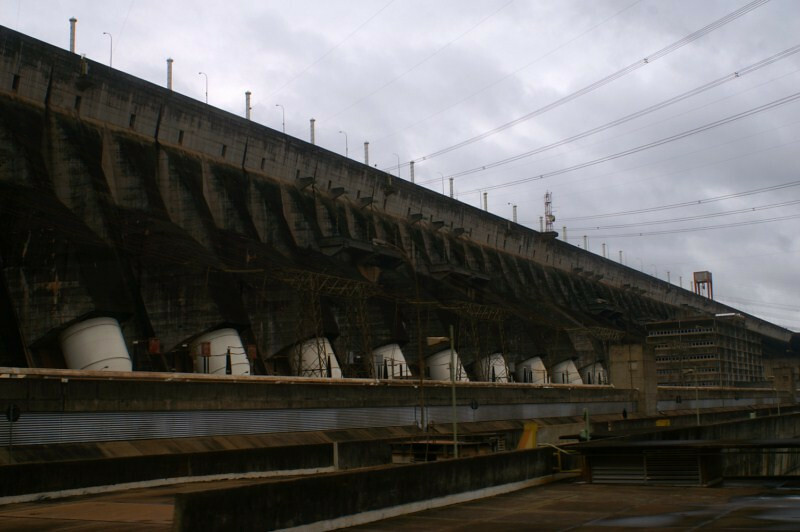 But there’s another site of interest in town, the gargantuan Itaipu Dam. 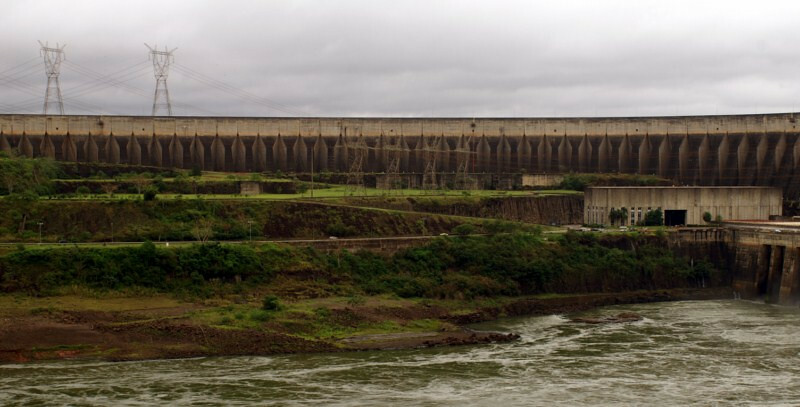 Built in the early 80s on the Parana River, it straddles the border between Paraguay and Brazil with both countries sharing the cost and benefits. It was the world’s largest dam until the Three Gorges project was finished recently in China. 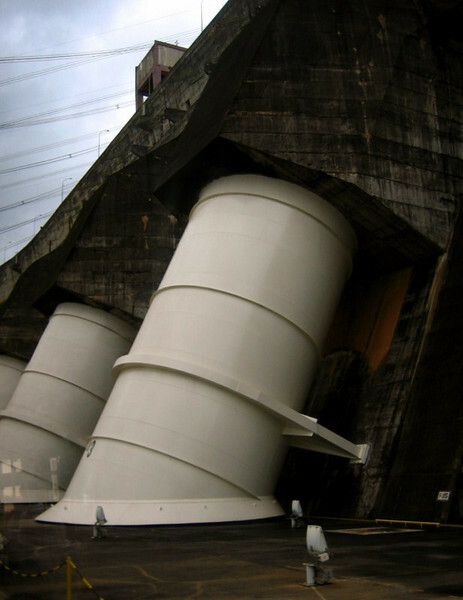 But since that dam is still ramping up its electrical generation, Itaipu still stands as the largest source of hydroelectric energy in the world. It produces 80% of Paraguay’s electricity needs and about a quarter of Brazil’s. This along with developing sugarcane ethanol has led Brazil to be largely fossil-fuel independent compared to many western nations and rightly or wrongly is seen as a model forward for many developing nations. One fact that gets repeatedly ignored by proponents of hydroelectric energy is the change to the terrain that happens from the reservoirs that form behind these huge dams – their ecological footprints. While the benefits of ‘clean energy’ are touted as being worth it for the price local peoples and animals have to pay, there is change to regional climate and downstream environments that are ignored. They say this reservoir engulfed a waterfalls as impressive as the Iguazu falls. While hydro is considered a renewable energy, it comes with hidden costs that are not evident in the short term. 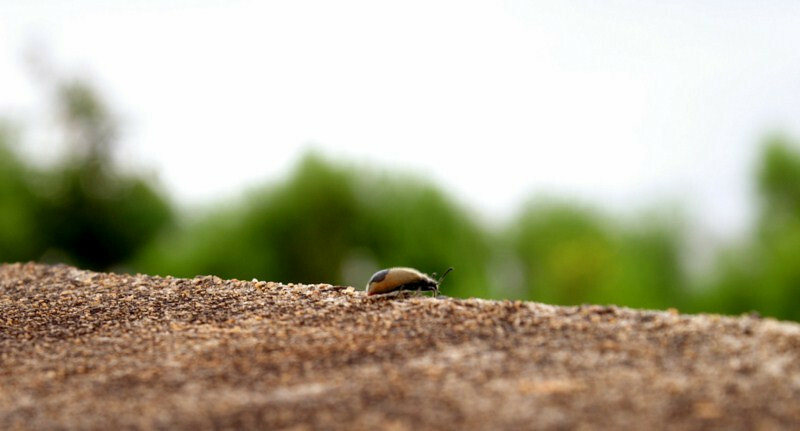 Do only humans have a say in how we shape this planet or do the little guys also matter? That evening I stayed with Kacilla thru CS (center) and she’s going to night school for a degree in tourism. I joined her to get some internet access and Bianca, on my left, of Japanese-Brazilian descent, wanted some help with her English lessons. Getting some kebabs after classes ended. 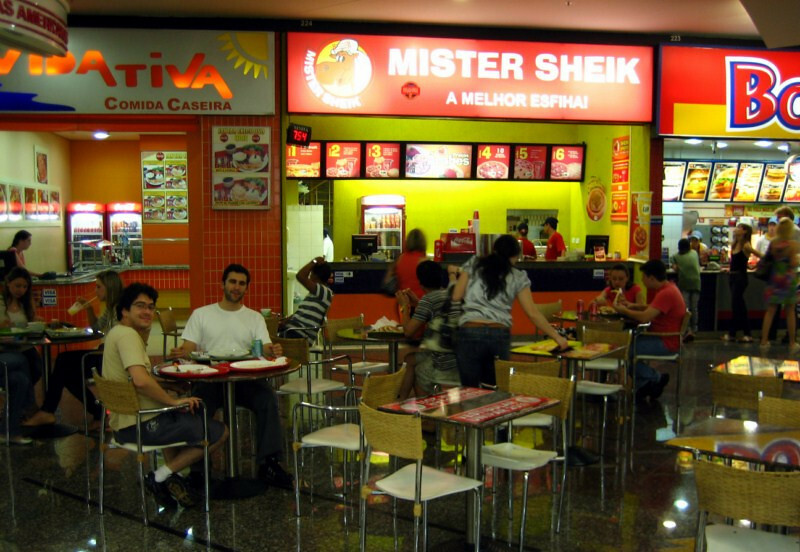 There’s a strong Lebanese influence in southern Brazil and it’s evident in the numerous kebab eateries. As usual, Brazilians sprinkle farofa on everything. Hoping for a clear day, I paid the hefty entrance fee (R$49, $28) to see the awesome Iguazu Falls. One of the natural wonders of the world. 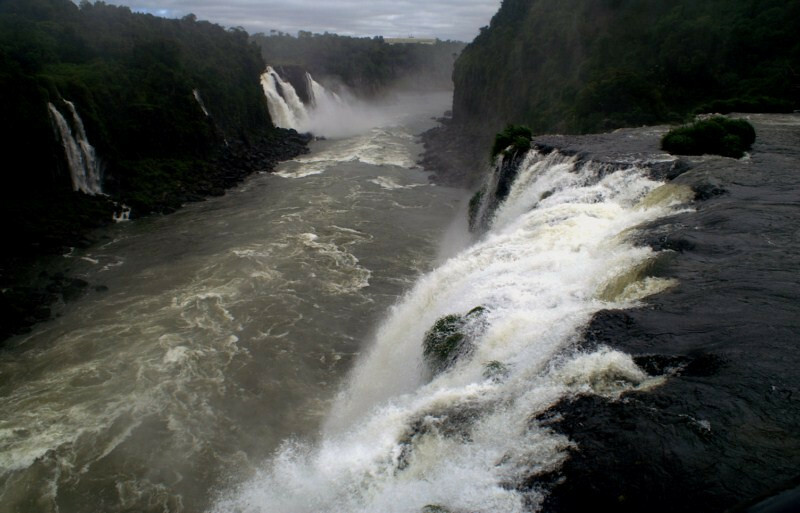 The Parana River flows over an escarpment and gushes water over the edge. 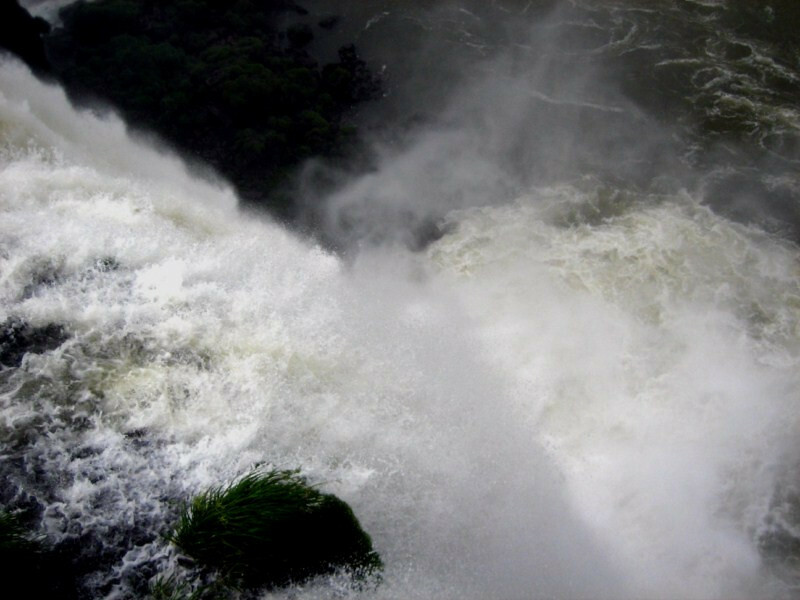 The Brazilian side of the falls allows you to get real close to the bottom of a set of falls and fully appreciate the force of water thundering down. Even with the Itaipu Dam upstream, the force of the water is very impressive. 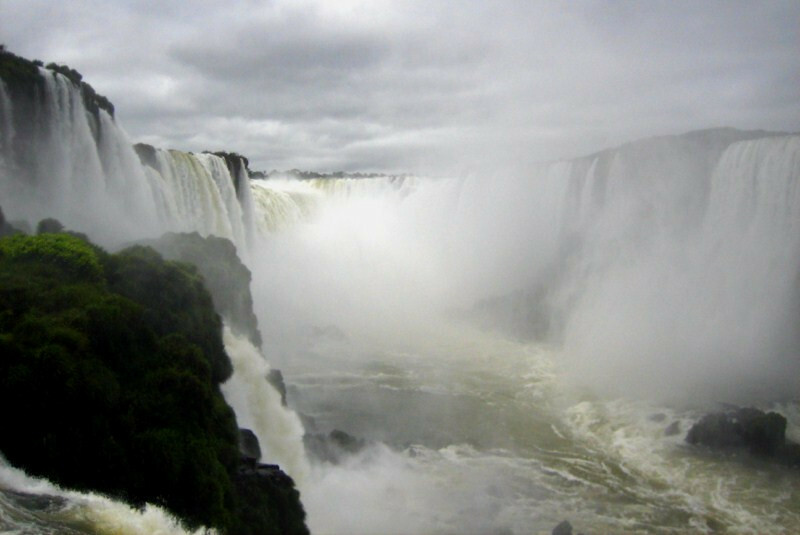 The falls straddle the border between Brazil and Argentina and there are different views from each side. 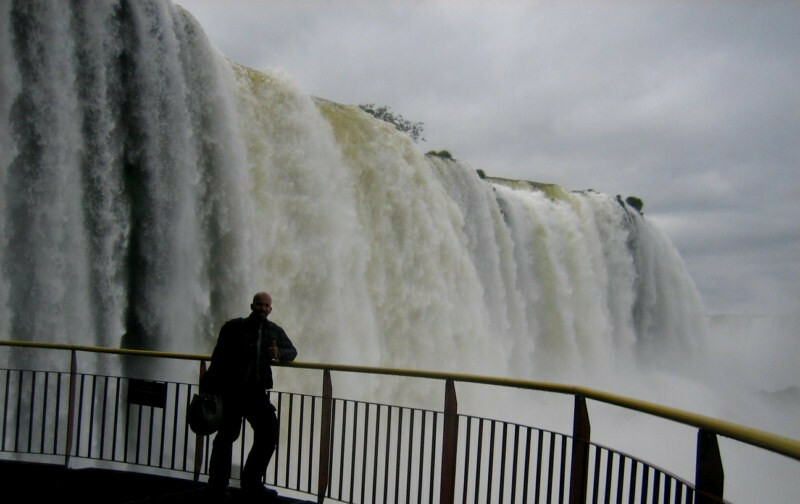 Here, on the Brazilian side, there are walkways that allow you to feel the heavy spray and get engulfed by the sound of the falling water. Looking downstream of the falls with Argentina on the left side. I think Niagara Falls has a higher flow rate per minute but Iguazu spreading out over a much wider mouth, resulting in about 275 distinct waterfalls, flows more water overall. And Victoria Falls in Zambia keeps the title of the longest curtain of water. This panorama stitch isn’t the best, but it gives an idea of the views from the Brazilian side looking across to Argentina. 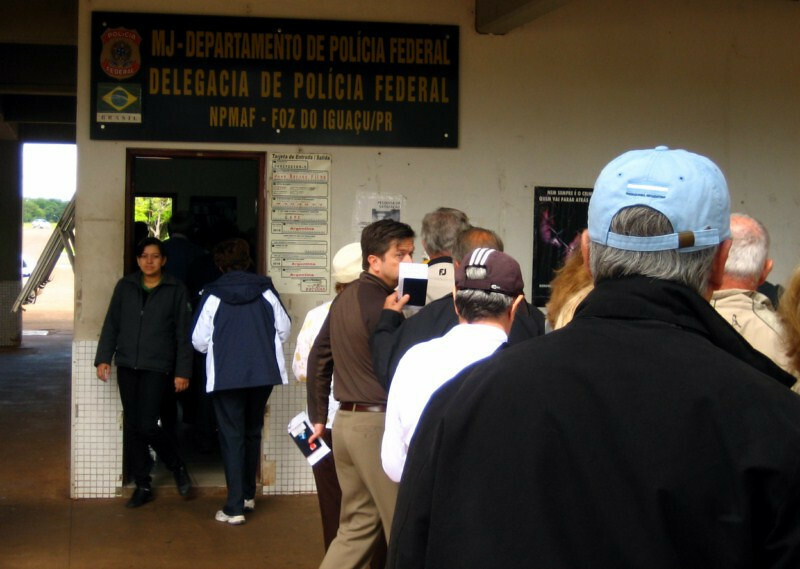 Checking out from Brazil at the federal police office at the border. My three month stay in Brazil came to an end with one day left in my visa. I had planned to stay for two months, but with how well things were going, it was easy to stay longer. 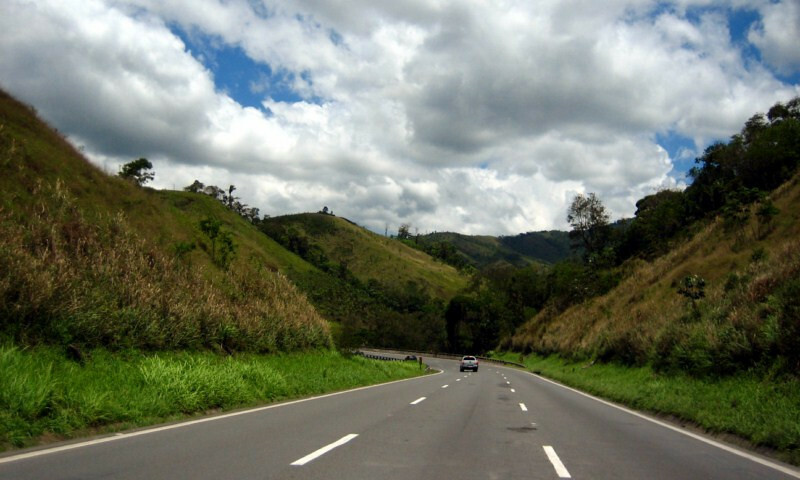 I started in the remote regions of the Amazon and crossed the rainforest on the TransAmazonica Highway and slowly came down the coast towards ever greater development resulting in the megalopolis of São Paulo. Rio on the other hand showed how wonderful a huge city could be, blessed with fantastic geography. I found my slice of paradise in Picinguaba and in all the Brazilians that I came in touch with. There’s an energy you feel that emanates from the people and I think I need to spend more time here to better understand it. Travel is expensive through Brazil (compared to neighboring countries) but with their beautiful smiles and sweet-sounding Portuguese, you’ll be happy to pay whatever it costs to experience some of the good vibes of Brasil.